Ian McShane has shared some new details about the Deadwood movie and teased a sequel. It was announced earlier this week that the long awaited movie will debut this spring on HBO after years of hearing rumors about the project. No official release date has been announced at this time, but the spring release makes sense to be in consideration for the 2019 Primetime Emmy Awards. With that being said, we could end up seeing a bit more Deadwood in our future if everything goes smoothly. The Deadwood movie takes place ten years after the series and Ian McShane is back as Al Swearengen. The movie shows the characters reunite to celebrate South Dakota's statehood and former rivalries are reignited, according to the brief synopsis that we have been teased with. Thankfully, McShane has some more specific information for us. He had this to say. "Deadwood is celebrating South Dakota as a state, and Hearst has come back and Alma has come back in town, so you have all the main characters converging and how they changed in 10 years. Now Hearst wants to put telegraphs in town, which isn't going too well. Al has had a little bit too much of that over the years. There's a surprise for Trixie and Star." When we last saw Gerald McRaney's George Hearst and Molly Parker's Alma Ellsworth, George had forced Alma to sell her bank to him and leave. As for Paula Malcomson's Trixie, she was one of Al Swearengen's favorite girls at his saloon/brothel and was last seen in a relationship with John Hawkes' Sol Star. It sounds like things could get pretty messy for all parties involved, which sounds about right for Deadwood. 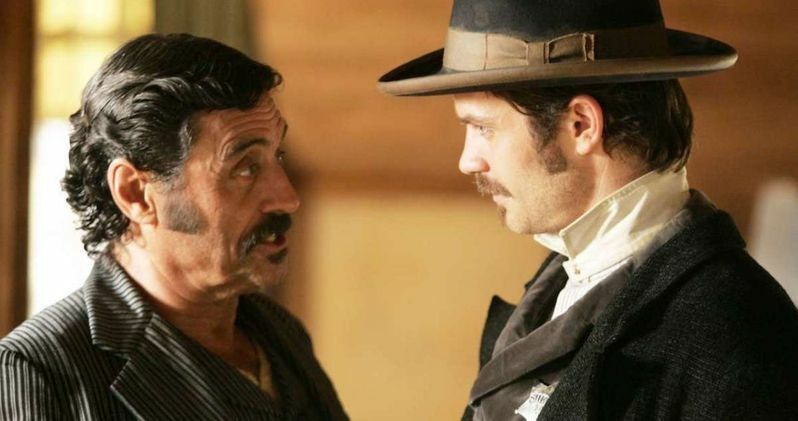 Deadwood fans were led to believe that there were two movies in the works, right after the series came to a close in 2016. As for that happening this time around, it seems that it is a real possibility. "It ends leaving you wondering. If it makes $115M, HBO will somehow find a way to do another one," according to Ian McShane. With one movie on the way this spring and the chance of another in the near future, fans of the hit HBO series will more than likely be very excited. While a second Deadwood movie has not been confirmed, we can all still look forward to seeing the first one in just a few months. Production on the project wrapped back in November of last year and we have yet to see any footage from the project. However, since the release is just around the corner, we'll more than likely get a trailer in the coming weeks. For now, fans will just have to wait. But while the wait continues, you can head over to Deadline to read the rest of the interview with Ian McShane.